Tag line: "The Maddest Love that ever possessed a woman"
Going in, Spellbound had all the makings of a cinematic classic. Directed by Alfred Hitchcock, easily one of the most recognizable filmmakers in motion picture history, and starring both established screen legend Ingrid Bergman and a brash newcomer named Gregory Peck, it was a movie that seemed destined for greatness. Yet remarkably, the combined efforts of its director and stars could not overshadow Spellbound’s most famous scene; a dream sequence designed by Salvador Dali, arguably the most prolific surrealist of the 20th century. Dr. Edwardes (Gregory Peck) has just taken over as the director of the Green Manors mental asylum, replacing the very popular Dr. Murchison (Leo G. Carroll). 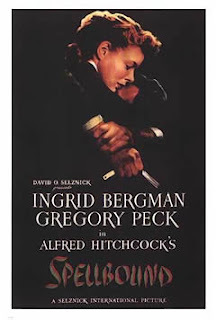 But it isn't long before resident psychiatrist Constance Peterson (Ingrid Bergman) senses something is very wrong with the facility's new administrator. After doing a bit of research, she discovers that the man calling himself Edwardes is not only an imposter, but one who suffers from amnesia as well. On top of that, this man freely admits he may have killed the real Dr. Edwardes, though he can’t actually remember doing so. For assistance, Dr. Peterson takes the imposter to meet her mentor, Dr. Brulov (Michael Chekhov), who warns his former protégé that she might just be aiding and abetting a killer. But Dr. Peterson has fallen in love with the mysterious stranger. Believing him innocent of any crime, she'll now do everything in her power to prove it. “I was determined to break with the traditional way of handling dream sequences”, Hitchcock told Francois Truffaut in 1962. “I wanted Dali because of the architectural sharpness of his work”. As was usually the case, the great director made a very wise decision. The entire dream is a breathtaking collection of images and movements, both strange and strangely compelling. Rarely had such bizarre visuals been produced for the screen; tables and chairs held in place by human legs, large curtains emblazoned with staring eyeballs, and a faceless man, pushing a skier off a high roof as he holds what appears to be a wheel. With Dali's flair for the extravagant and Hitchcock's incredibly perceptive eye joining forces, the scene proved a marvelous bit of fantasy, years ahead of its time. An entertaining look at the field of psychiatry (one of the earliest to delve deeply into the profession) that featured solid performances from its entire cast, Spellbound nonetheless owes its notoriety to a sequence that lasts approximately two minutes and 40 seconds, one you simply have to see to believe.